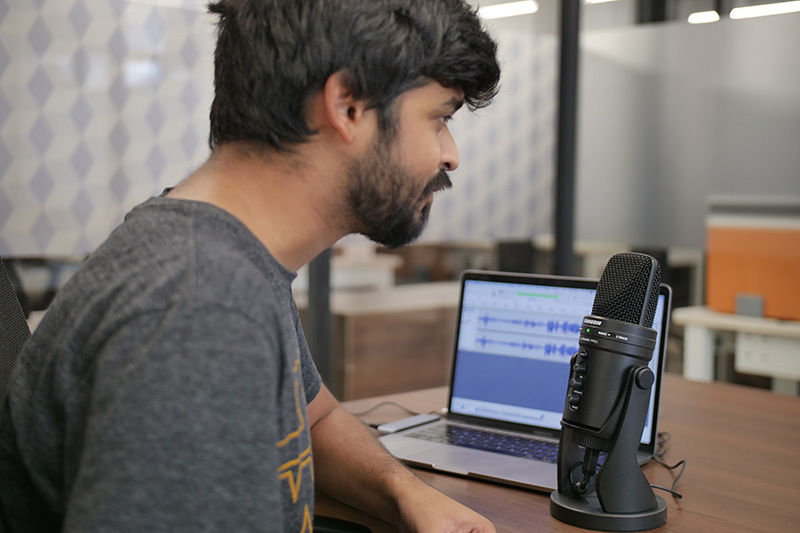 For the longest time, we, here at Beebom used the Blue Yeti to record audio for our YouTube videos, and it worked like a charm. We’ve since switched to using a wireless mic instead, and the Blue Yeti lies unused, gathering dust… but I’ve always been fond of that mic. So when we received the Samson G-Track Pro USB microphone ($149, available in India unofficially for Rs. 21,955 on Amazon India), it certainly brought back many memories, and I decided to give it a shot and see what it’s like. So, I’ve used the mic quite a bit, and these are my thoughts on whether it’s a good mic to go for. 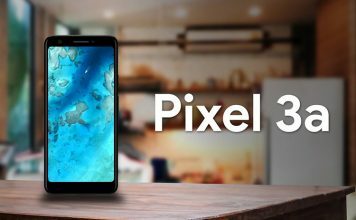 Before we jump into the review itself, lets get the specs out of the way. 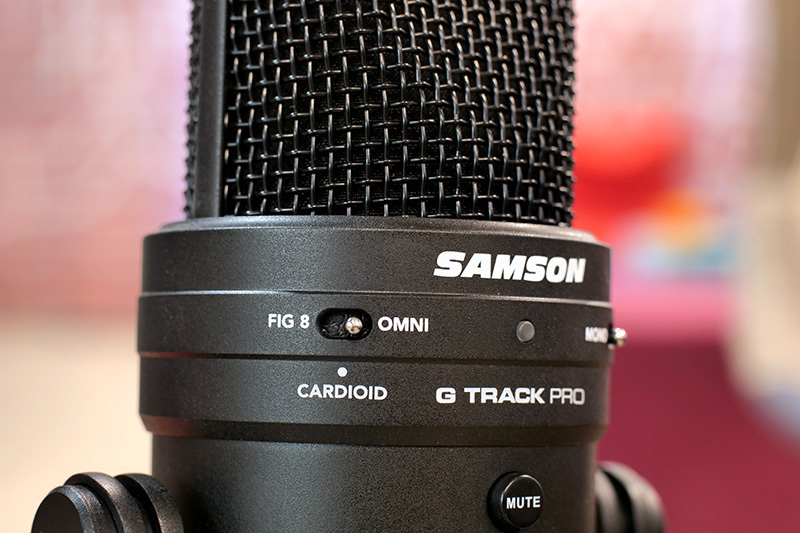 Looking at the Samson G-Track Pro, one thing that stands out immediately is that it’s a rather well designed mic. 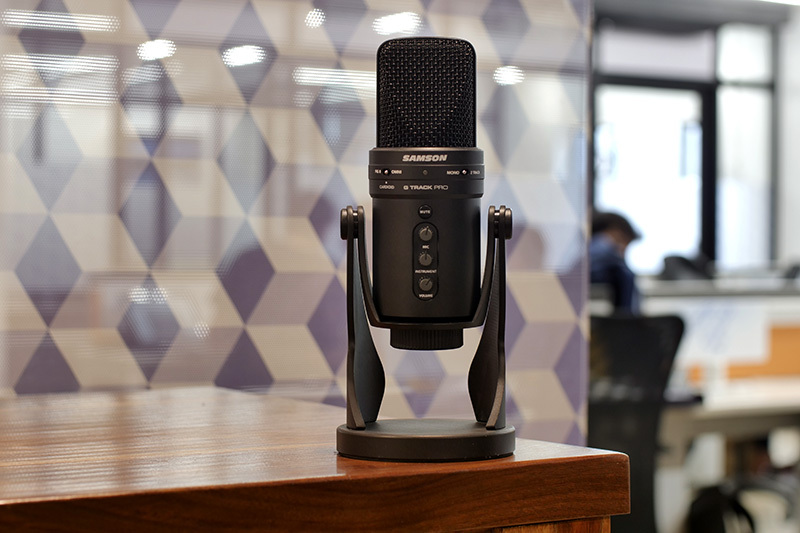 Plus, in the stealthy black color that Samson has opted to go with, the mic looks even better, especially when compared to the Blue Yeti that we’ve used in the past. To be fair, the Yeti opts to go with a more rounded look which a lot of people probably like, whereas the G-Track Pro leans towards sharper angles especially on the mesh itself. Personally, I prefer the design of the G-Track Pro over the Yeti. Speaking of preferring the Samson design against the Blue Yeti, I have another point to back up this claim. Both the Yeti and the G-Track Pro fold inwards into their stand for a more compact storage solution. However, while the Yeti uses screw-caps that you manually have to tighten and loosen in order to rotate the mic in the stand, the G-Track Pro doesn’t require you to do that. Samson has opted to go with what they call “permanent grip-hinges.” What this means is you don’t need to manually unscrew the caps before moving rotating the mic into a preferable position. That might not sound like a big deal, but when you’re dealing with recording audio as much as we here at Beebom do, constantly loosening and tightening a screw-cap can quickly get annoying and time-consuming. Other than that, the G-Track Pro can be unscrewed from the base if needed, and then mounted on another mic-stand or a mic-arm if that’s what your recording scenario requires. I personally didn’t need to do that, but it’s there if you need it. 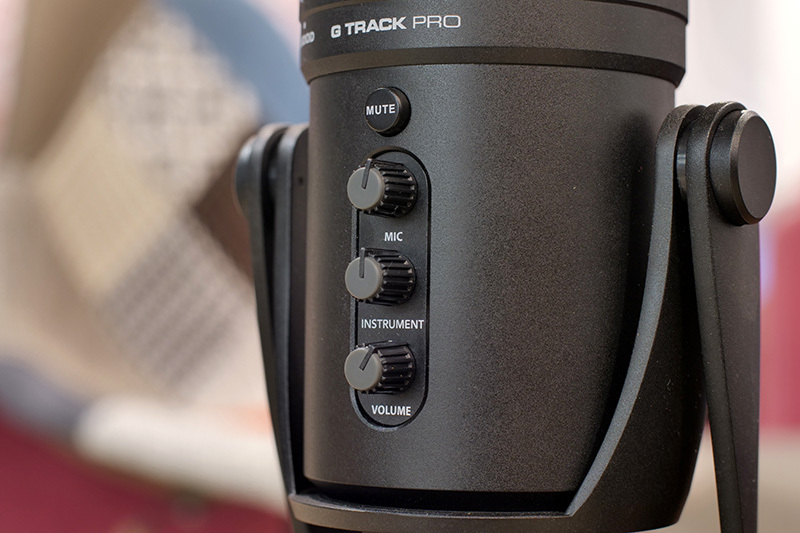 Everything about the G-Track Pro’s design shows that it’s built to be as easy and self-explanatory to use as a mic of this caliber can be. 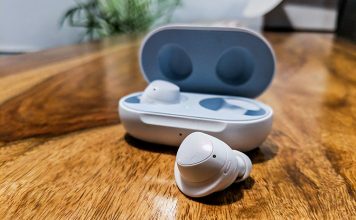 The three knobs on the front are smooth and let you control the input volume for the mic, the input volume for any instrument you may have connected to the mic, and the output volume if you’re monitoring the recordings with a pair of headphones. 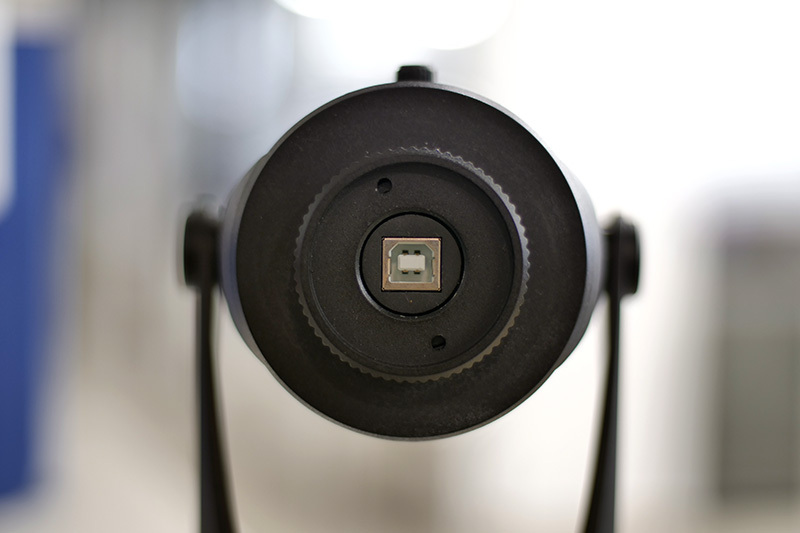 On the bottom of the mic, you’ll find the USB Type-B port to connect the mic to a laptop with the USB Type-B to USB Type-A cable that’s provided in the box, and on the back, there’s the headphone out port, and the instrument-in port. This in itself makes the G-Track Pro slightly better than the Yeti, which doesn’t have an instrument-in port. This instrument port (line-in port in other words) can also be used to connect an additional mixer to your recording set up so you can technically do something like attach additional mics to your mic. I didn’t try it out though, but according to Samson, it can be done so that’s definitely a plus. There’s also another switch on the back to turn Monitoring on or off (which I’ll explain later). On the front, there’s an LED light as well which lights up in different colors to denote different things. So the light is green when the mic is powered on, yellow if the mic is muted, and red whenever your audio is getting clipped from overload. The Samson G-Track Pro is a pretty feature rich mic, as you’d expect from a $149 USB mic in the first place. For starters, the mic supports three different polar patterns: cardioid, omnidirectional, and bi-directional (figure 8). If you’re unsure what these mean, let me give you a quick primer. In omnidirectional setting, the mic records sounds from every direction, so no side is the front for the mic. 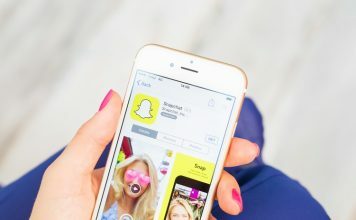 This is great for recording multiple people, and is a good fit for something like a podcast with more than 2 people. 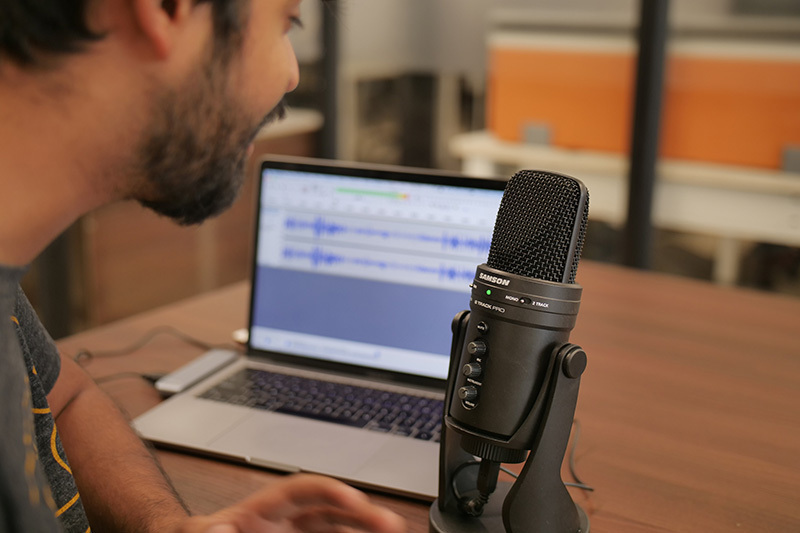 In bi-directional, the mic records sounds from the front and the back only, making it the best setting for recording interviews, or podcasts with just 2 people. In cardioid, the mic only records sounds from the front, making it perfect for recording a voice-over, or for recording music (which is what I mostly used the mic for). 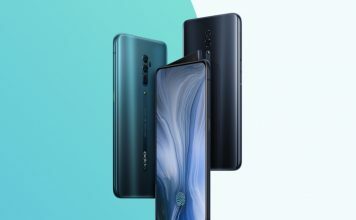 Other than that, the mic supports line-in instruments to be plugged directly into the mic, and that’s definitely awesome especially if you’re like me and you like to record yourself playing an instrument while singing along. I did test out the mic with a couple of songs on the guitar, and the recording quality is excellent. Personally, I felt the recording was clearer than what we used to get with the Blue Yeti, even before any noise reduction or editing chains were applied on it. The G-Track Pro also comes with support for direct monitoring which is something a lot of people interested in recording music will love. If you’re unsure about what that means, here is a quick primer in layman terms. Basically, when you’re recording on a mic (or even an audio interface such as the Scarlett 2i2 I use personally) and you use a pair of headphones to monitor the audio, there is usually some delay between the audio being recorded and the audio you’re hearing on the headphones. This can really mess up timing in music recordings and that’s not desirable at all. 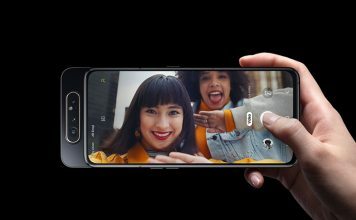 With direct monitoring there is absolutely no noticeable delay between the audio being recorded, and the audio you’re hearing in real time from the headphones — that’s a feature I’m really happy to have on the G-Track Pro. One of the more important selling points of USB microphones is the ease of set up, and the Samson G-Track Pro is no different. Since I use the Scarlett audio interface at home, set up takes some time. First you connect the interface to your laptop with a USB cable, then you connect the instrument to the line-in port on the interface, and a mic to the XLR input of the interface, and then you can start recording — it’s a mess of cables. With a USB microphone such as the G-Track Pro, you just plug it in to your laptop, add an instrument if you want, and get recording. There’s only one (or maybe 2, if you add an instrument) cable around. It’s pretty neat and easy to set up making it perfect for quick recording sprints. To be fair, that’s not something unique to the G-Track Pro, because every USB microphone (that I’m aware of) has a set up as simple as this, including the Blue Yeti. Once you have this mic set up, you can just fire up your audio recording software (Audacity is a good one) and get started. I used this mic for a while, recorded a couple of songs on it, and it’s definitely a really great mic. Here’s a sample recording from the Samson G-Track Pro. Note that this recording is straight from the mic without any noise removal or audio editing done. Even though my thoughts about the G-Track Pro are overwhelmingly positive, there are pros and cons to it as well. All things considered, the Samson G-Track Pro is definitely a mic that I can recommend to anyone looking to record audio of any kind. If you’re a budding streamer, or you want to start your own podcast, or even if you’re like me and you simply want to record an instrument while singing along, the G-Track Pro will serve you well and faithfully, and judging by its build quality, it’ll serve you for a pretty long time. 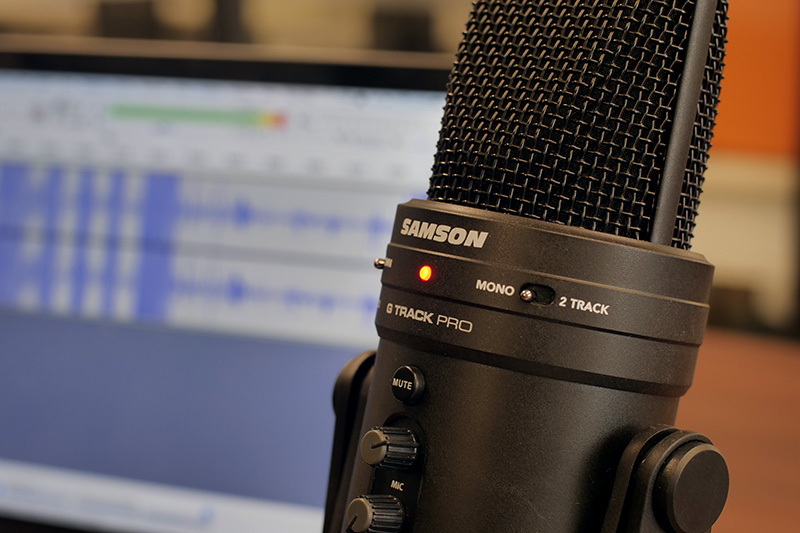 At $149, the Samson G-Track Pro is one of the best mics you can get, with features, recording quality, and build quality being the main considerations. Its closest competitor, the Blue Yeti ($129, Rs. 9,999) is a pretty good mic as well, but it lacks features like a line-in input port, or the ability to turn direct monitoring on and off. Plus personally, I found the sound recorded by the Samson G-Track Pro to be fuller and clearer than the Yeti’s. That said, the mic hasn’t yet officially launched in India, but it should be here soon. 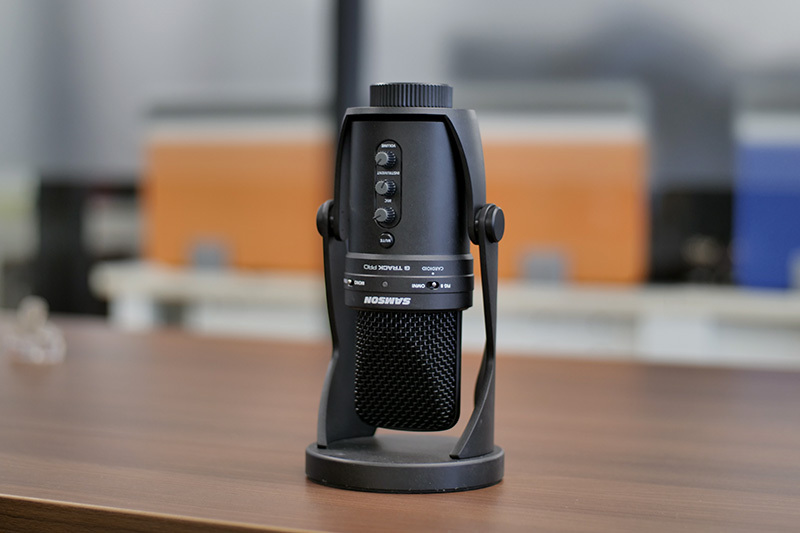 The Samson G-Track Pro is a USB microphone that's every bit as versatile as you might want it to be, and offers a recording quality that's really impressive. If you're a streamer, a podcast host, or you just want to record song covers with your guitar or keyboard, the G-Track Pro is definitely the mic you wanna get.